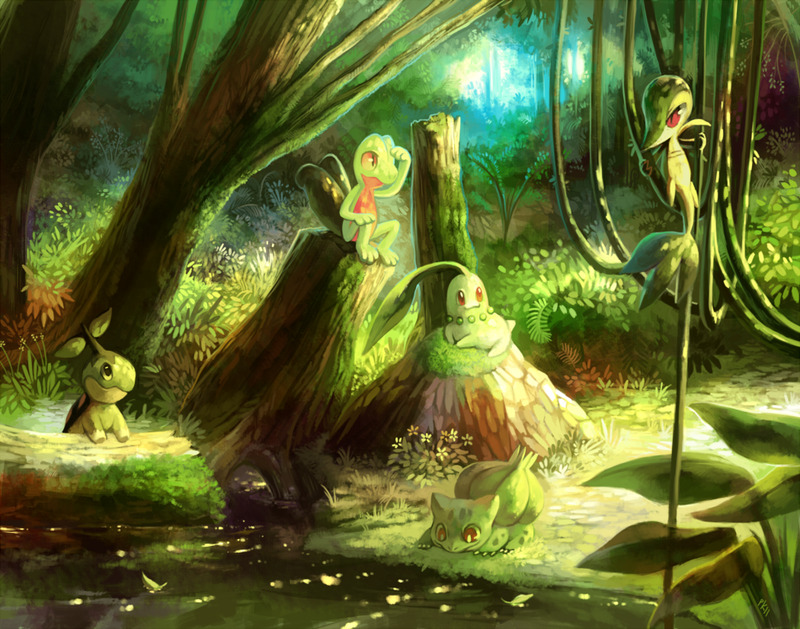 The world of Pokémon: a magical land filled with adventure, evil, and sentient ice cream. 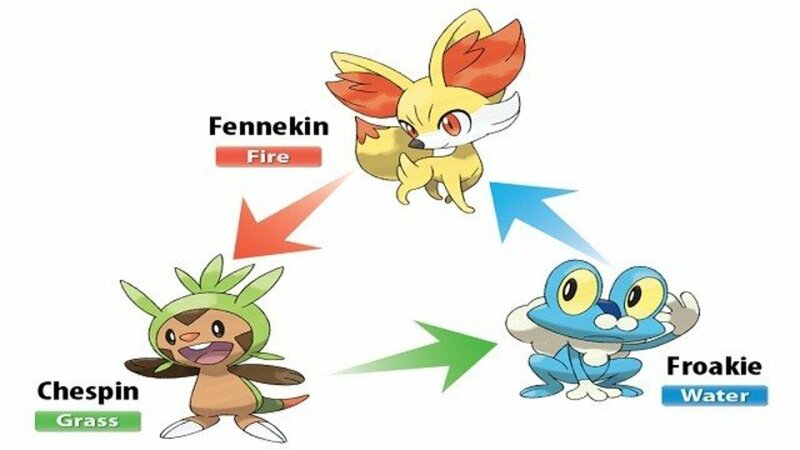 In almost every Pokémon video game you play as a young Pokémon Trainer who selects their first companion from one of three monsters - a Grass, Fire, or Water-type. 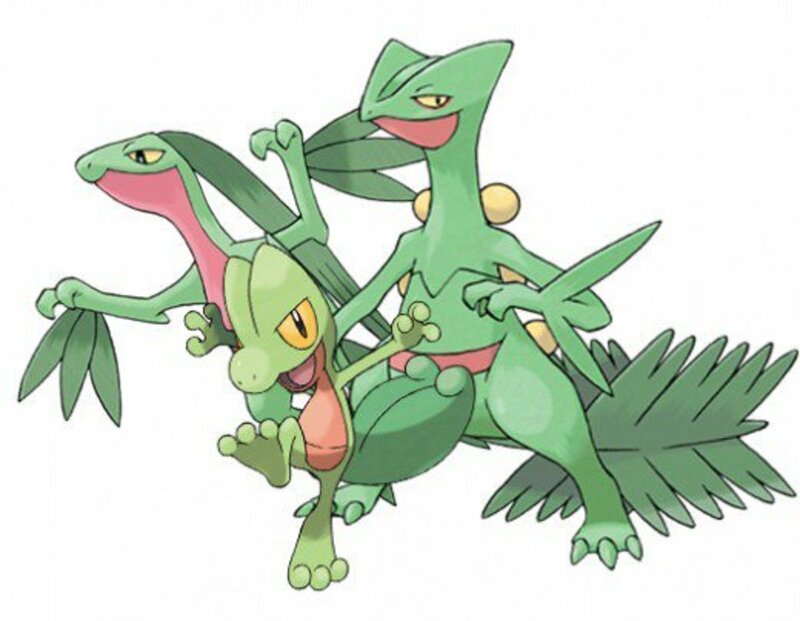 All "starter" Pokémon can become powerful, and evolve into new two forms, but some demonstrate greater combat prowess than others. Today, we'll score the best aquatic companions, factoring in stats, moves, and typing! First up, we have Oshawott, the Sea Otter Pokémon. 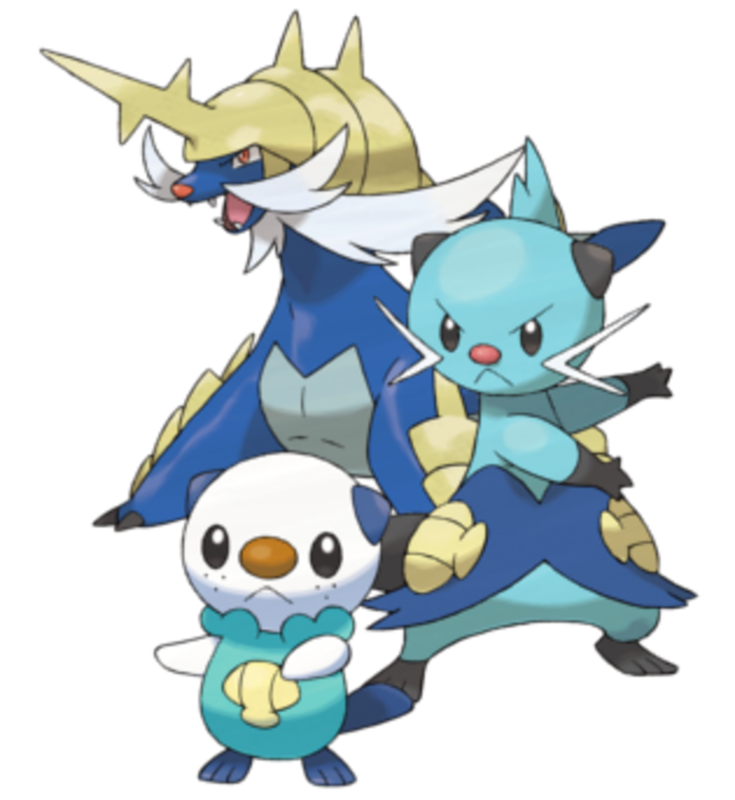 Oshawott ultimately evolves into the fearsome Samurott, retaining its pure Water-element the whole way. Samurott's base stat total (528) is the lowest of any of today's creatures. Additionally, not much stands out with its statistics - Samurott is fairly well-balanced, slightly favoring offense over defense. The creature has good attack and special attack, so you fight with both physical and elemental attacks; however, Samurott's lack of focus in any area hampers its overall usefulness. 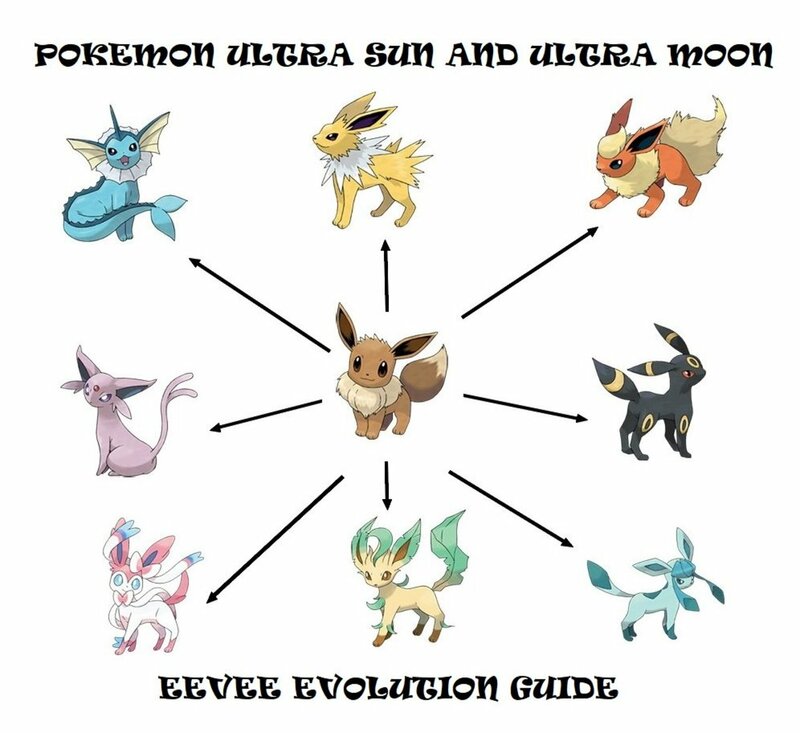 It'll learn mostly Water and Normal-type attacks, and they're decent ones, but more options would be preferable. Finally, consider that you can easily obtain other strong Water-types in Unova; thus, you may want to select Grass-type Snivy or Fire-type Tepig as your starter instead. Trivia: Oshawott is the only Water starter whose design is based on a mammal. This feisty reptile first changes into Croconaw, then into the intimidating Feraligartr. 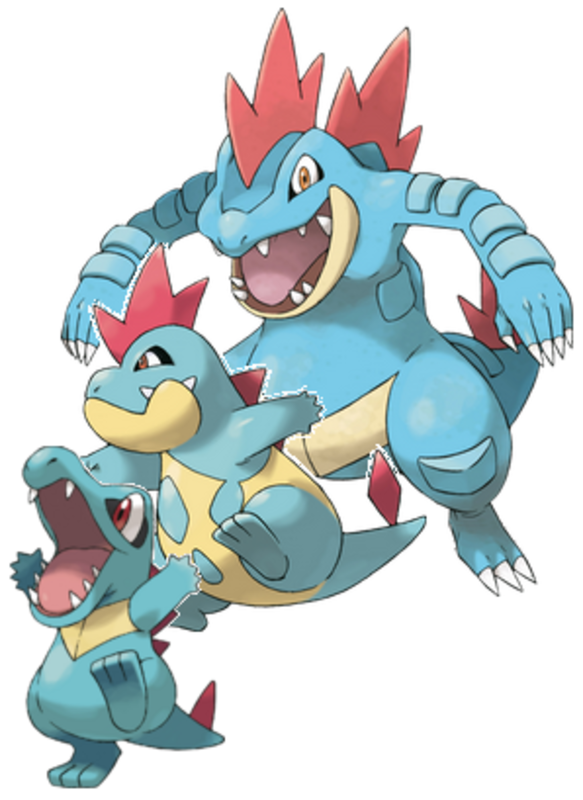 Like Oshawott's family tree, Totodile won't gain any new types upon evolving, simply retaining Water. As Feraligatr, you'll have a mighty companion. It stats are favor the attack and defense traits- bombard your adversaries with physical attacks to decimate their hit points. Feraligatr's ability to dish out and withstand physical damage makes it very helpful. The only downside to this monster are its moves - its best attacks are only learned upon reaching very high levels (some in the 60's and 70's); you'll likely beat the game before obtaining these techniques. Still, you can use TM and HM items to teach Feraligatr attacks, so don't overlook this monstrous fighter when playing the Johto games. Trivia: Despite speed being its its worst statistic, several Pokedex entries comment on how quickly Feraligatr can charge opponents. Weird, huh? Next, the frog Froakie. This amphibian eventually morphs into Frogadier, then the ninja-like Greninja, who gains Dark as a second element. Water/Dark is a strong combination; it's weak to four elements, but resistant to five and completely immune to one. This helps Greninja withstand attacks; useful, considering its statistics heavily favor offense. Greninja has low hit points, defense, and special defense, but impressive attack, special attack, and speed. It can hit fast and hit hard. And its techniques are impressive; the best ones aren't learned until very high levels, but this is made up for by having a wide variety of elemental attacks. Greninja will develop Water, Dark, Ghost, Normal, and Psychic attacks, giving you many options. 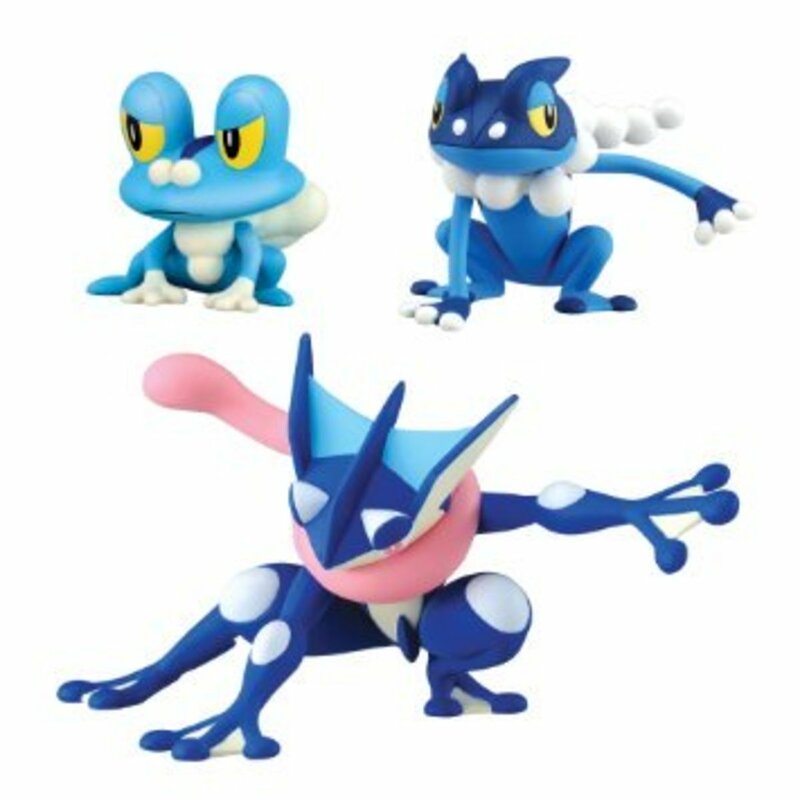 If you seek a nimble and hard-hitting companion who can resist many elements, Froakie is the starter for you. Trivia: By the way, do you see that pink "scarf" on Greninja? That's actually its tongue! Many of us remember Squirtle Pokemon's first Water starter. The spunky turtle will evolve into a Wartortle, then a Blastoise, a pure Water-type with a stat total of 530, spread to favor the defenses. Factor in Blastoise's many guarding techniques (Withdraw, Iron Defense, Protect, etc.) and you have a mighty tank. Blastoise also learns Skull Bash, a move that both boosts defense and inflicts a heavy blow. Besides that, Squirtle's family will gain a variety of Water techniques and one Dark attack; consider using TMs to teach more elemental moves. 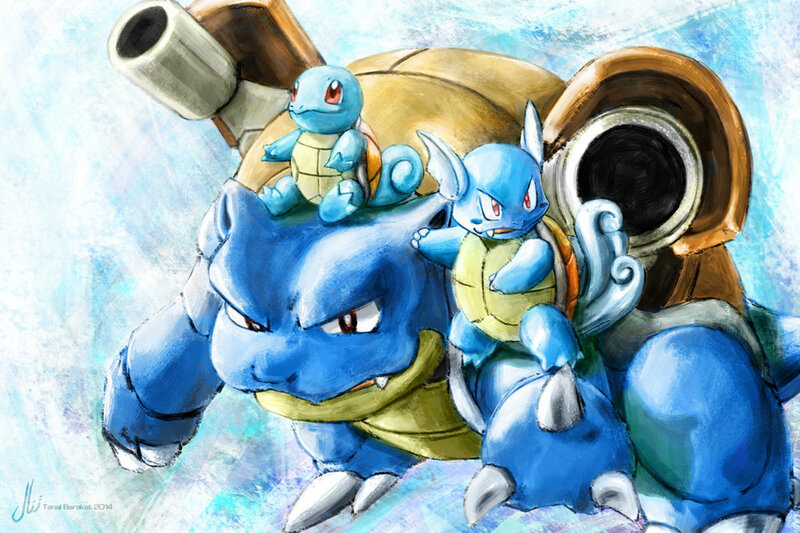 The Kanto region is full of Water-types, but few are as useful as Blastoise will be. As a bonus, Squirtle's Water element is strong against the first Gym Leader you'll face, Brock, making that battle a breeze. Trivia: Blastoise deliberately seeks to gain weight, which helps it withstand the recoil from its water cannons. This creature is classified as a "Mud Fish" Pokémon. Kinda weird, but don't let that fool you - Mudkip packs a large punch. It'll eventually turn into Swampert, a Pokémon with strong hit points and physical attack. Swampert's physical power far exceeds its special attack, so stick to brute force. Its defenses aren't bad, either, just be aware that it has a low speed, and will probably attack second in battles. Swampert is a dual Water/Ground type, which proves to be a strong combination. Water Pokémon are usually weak to Electric moves; however, Ground types are immune to them, negating the weakness! Thus, Swampert is resistant to four elements, immune to one, and weak to only a single type - Grass. Factor in a variety of Water, Ground, Rock, and Fighting moves, plus today's highest base stat total (535), and you have an excellent starter Pokémon. 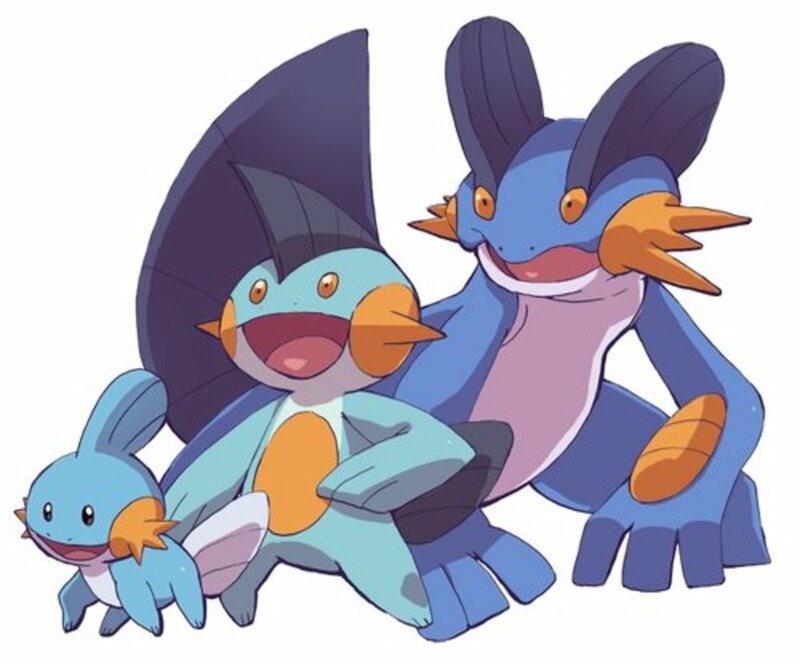 Mudkip's family are great Pokémon to use but it's also okay to pass on them; Hoenn has plenty of strong Water types, and the other starters in the region also impress. Trivia: Swampert is so strong that it can swim as fast as a jet ski and easily drag objects that exceed its own weight. First place goes to the potently powerful penguin Pokémon, Piplup. Piplup looks somewhat silly, but ultimately turns into the mighty Empoleon. Empoleon's only low stat is speed; it excels in special attack and special defense, making it an elemental powerhouse. Empoleon also unlocks a variety of attacks including Water, Steel, Flying, and Normal techniques. 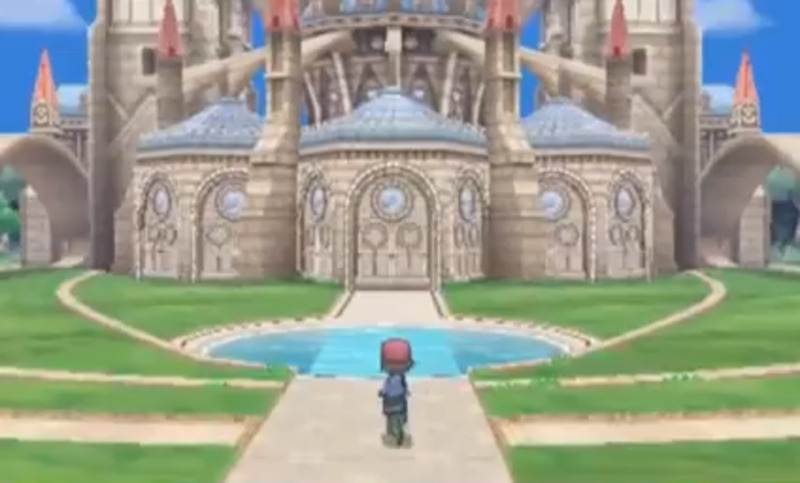 But the real prize here is Empoleon's dual type, Water/Steel. This combo has an amazing number of resistances, making Empoleon very hard to knock out. 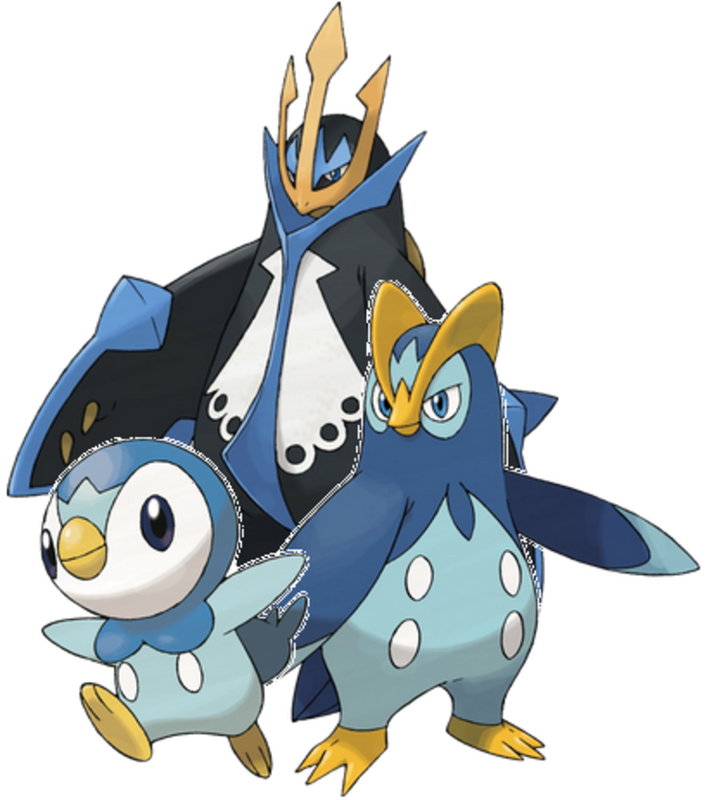 In Empoleon's original games, it resists a whopping eleven types, plus a complete immunity to another, at the expense of only three weaknesses. In the Generation 6 games (X & Y) and beyond, Steel types no longer resist Dark and Ghost moves, but the new Fairy type was added, which Steel does indeed resist. Basically, throughout the games there are some minor changes in Empoleon's defenses, but it will reduce damage from an amazing amount of sources no matter which you're playing. This Pokémon also can dish out the hurt with its high special attack and excels as Pokemon's greatest Water companion. Trivia: The somewhat short Empoleon has its name derived from the words Emperor (as in emperor penguin) and Napoleon (as in Napoleon Bonaparte, the famous French emperor). 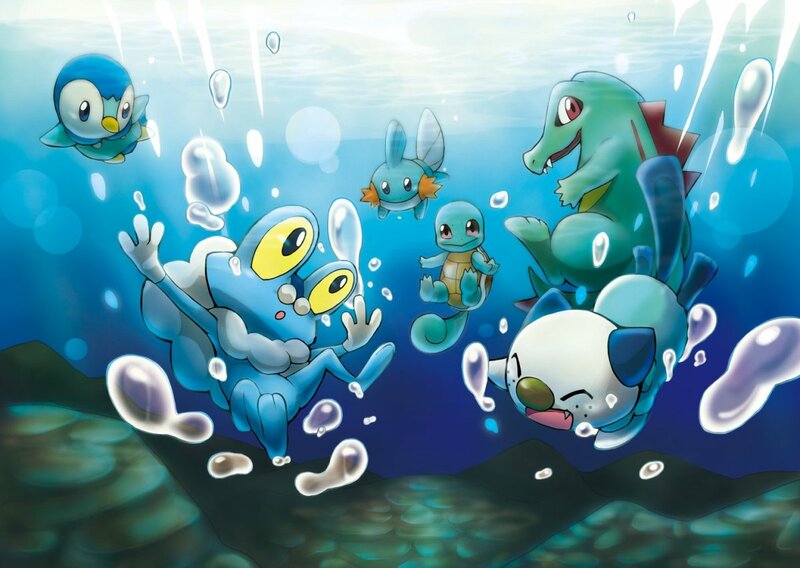 Which aquatic Pokemon do you prefer? Some starters fare better than others, but they can all be fearsome. Often I discover players have more fun training the Pokemon they bond with over the ones with the highest stats - select whichever starter tickles your fancy. Feel free to vote for your pick, and I'll see you at our next countdown! 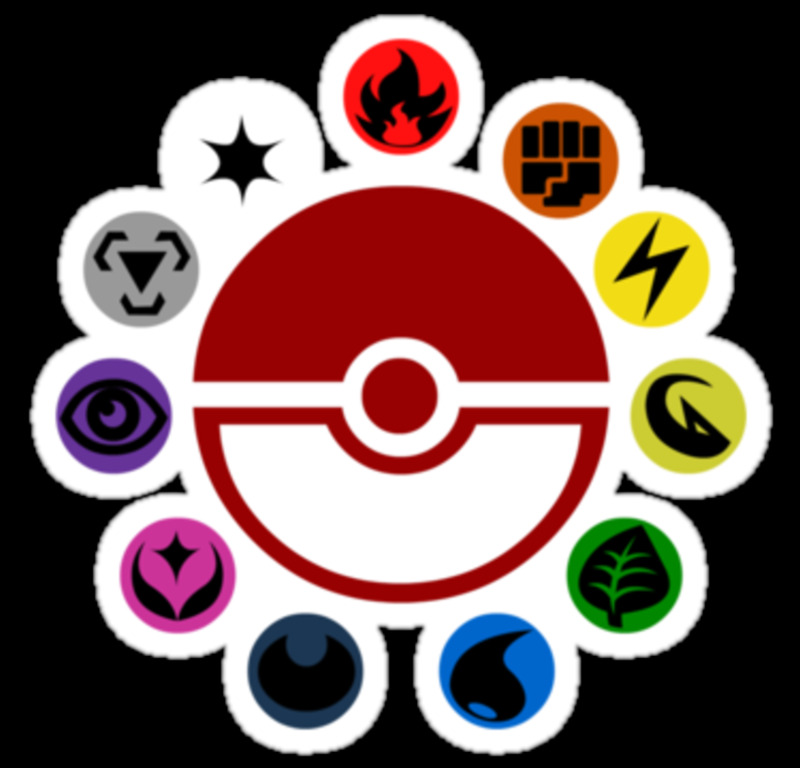 Who is the best Pokemon Kanto starter? For the game's story, Bulbasaur/Venusaur since Grass is strong against the first three gyms, and you'll have other monsters by the time you hit gyms you're weak to. Competitively, probably Charmander/Charizard, although that quad weakness to Rock can be risky against a Stealth Rock foe. Well anyway I do love frokie and I also love mudkip so if I could vote for two then I would. Also so excited for the new starter Sobble because when my friend described the new starters to me and he described sobble I was like wait did you just describe me or the pokemon? Greninja is hella overrated though. I prefer either Piplup or Mudkip. well what i like is greninja cuz i play pokemon brick broze greninja kinda cool. but can it be ash-greninja? i mean can it? i want to try it. Hey everybody who is still reading this in 2018? Who plays Roblox? There is a game called Pokemon Brick Bronze, I had Tepig, Rowlet, and Piplup. When I used Piplup, I called it the destroyer. It fainted almost every pokemon in a hit! Samurott can sometimes actually be better than greninja want to know well ive had use out of the move set swords dance mega horn aqua jet razor shell as for the item your best is either an eiviolite oir quick claw samurott is also an amazing mixed attacker with alot of graet coverage moves its also the best to pick in black 2 and white 2 and i cant tell you the amount of teams ive swept with this thing I've tried to use other water type starters but due the mixed attacking unit and quick claw i've had much more luck with samurott so for those resons He's in my opinion hands down the best. 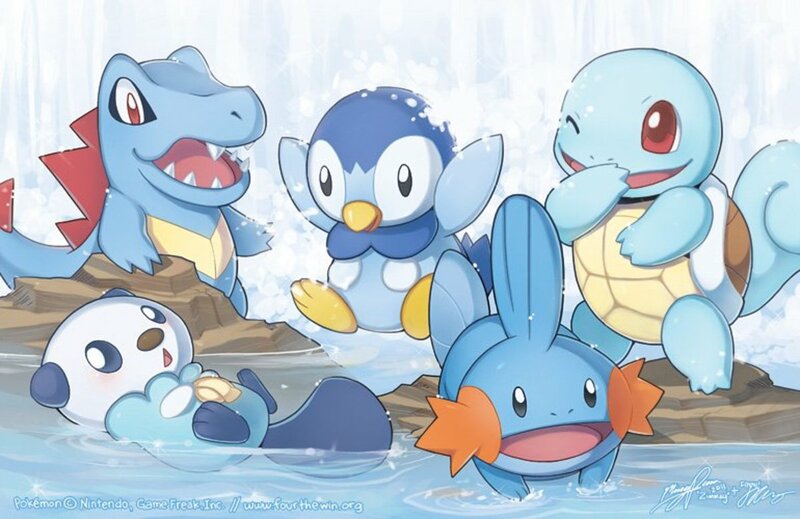 Everyone has their own opinion,but honestly,any of the water types are amazing.You can never go wrong when choosing squirtle,piplup,froakie,or even mudkip.It just depends if you have the game or not. GRENINGA WOULD MASH ALL DEM UPP!!!!! So, Mr. Pokelord, with that opinion of yours make Swampert top 6, right? Got some interesting usernames there guys ha. All the starters have pros and cons, I just happen to think Empoleon's type gives it a huge edge. But hey, to each their own. As your supreme Pokémon Lord, I'll have to tell you that you're wrong. The number one water starter is Froakie. Here's why: PROTEAN. Now I know what you're thinking, what the actual heck is PROTEAN? Now lemme tell you why PROTEAN makes GRENINJA a GODMON. Now you see, Greninja, as the fastest water type means it's one of the fastest Pokémon in the game currently. PROTEAN is its Hidden Ability which allows it to change its type depending on the element of the move it uses. While you don't get a PROTEAN GRENINJA as soon as you start you X/Y game, you can spend 200 battlepoints to get an Ability Capsule to change it which is pretty easy to get considering you're a Pokémon Master God. PROTEAN allows all of Greninja's moves to be STABS. PROTEAN also allows it to be an elemental setup tank, being one of the fastest IN THE GAME. This ability makes Greninja fill just about any role the game can throw at it making Greninja in some ways better than friggin ARCEUS. Although that's not that impressive considering a lot of Pokémon can out-do Arceus. If any of these reasons don't make you think Froakie is the best water starter, then stick to Grass and Fire starters. Water aint for you homie.